You can find the "Heart Back EP" on Myspace and on iTunes! It's been one year since NAMESAKE dropped a new track. Check out our new unreleased track "DREAM"(Can't Stop Me Now). This song came out of a year of trials and tribulations since we dropped our first record "Heart Back EP". This song DREAM is about still believing in your dreams when all seems lost. My music partner Mike Whang lost 50% of his hearing in February out of no where. Can you imagine being a musician and losing 50% of your hearing? Well, that's what happened to my boy Mike. It hasn't been easy, alot of questions went through his head and mine, but God is still good u know what I mean? That's what this track is about, it's about moving forward, onward and onward even when life throws you hits, you gotta keep believing in the Dream. Keep believing in God and keep believing in the dreams He's put in your heart. CAN'T STOP ME NOW! WE STILL PRAISE HIM. WUT!!! May we each day pray to remain content in Christ and Christ alone. Let us seek not to live a life of success but a life of significance. True success is being faithful to our values and convictions. May our values be that of God´s, that we may live a life of honor and integrity. May we never be greedy, desiring the things of this world because ´´The Lord is my Shepherd I shall not want¨. Lord, give me neither riches to the point I forget you, nor Lord give me poverty to the point I no longer look to you but to myself to provide. Keep me and my brother and sisters humble all the days of our lives. You are our good Father and from you we receive all good things. Amen. 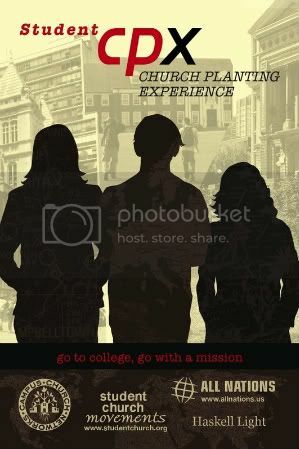 I am writing a blog post to invite you to Student CPx (Church Planting Experience) with Campus Church Networks and Student Church Movements this summer in Kansas City. This experience will be like no other, as the Holy Spirit has led our national leadership to start a intensive 2 week summer training (July 20- August 1, 2008) to equip student missionaries to start campus church planting movements on their respective colleges and universities across the nation. This experience will be unique as the Lord has opened a wide door of ministry at Haskell University in Lawrence Kansas. This university is the largest Native American University in the nation. Over 130 sovereign nations are represented on this campus and we believe by re-digging the ancient wells of revival and honoring the first nations people in this generation it will be a key to unlocking another student missionary movement across the world. You will spend two weeks living in community with seasoned overseas church planting missionaries from All Nations (allnations.us), Campus Church Networks staff, and other student church planters from universities across North America. You will worship and fellowship together daily, while practicing principles you will use when you return to your campus. You will be immersed in the culture and story of the Native American people, while living in a residence hall and daily practicing the Word of God through cross-cultural evangelism, discipleship and on the job church planting skills. When you go back to your campus you will be ready to start simple churches, not only there but wherever you go for the rest of your life. Our new national director Erik Fish who has pioneered campus ministry movements on many campuses will be heading up this training program with our National strategy director Sam Lee. This will be a 2 week encounter with God and adventure with the Holy Spirit you don't want to miss. Pray about coming to Student CPx. If the Lord leads you to come, please fill out our interest form ASAP. Also consider offering this unique opportunity to other students who could start simple churches at their universities in the upcoming academic year! I look forward to seeing many of you there! I support any holy outbreak of revival fervor. But let’s be careful to guard ourselves from pride and error. God is stirring deep spiritual passion in the hearts of the thousands of people who have traveled to Florida during the last month to experience the Lakeland Healing Revival. Since these meetings began in a 700-seat church on April 2, the crowd has moved four times to bigger venues, the fervor has intensified and the news has spread worldwide—thanks to God TV and online broadcasting. Within a few weeks, the bandwagon effect was in full swing. It’s safe to say that no outbreak of Pentecostalism in history has gained so much international exposure so quickly as these meetings have. I’m a cheerleader for the charismatic movement, so I rejoiced when I heard the news about revivalist Todd Bentley’s extended visit to Ignited Church. It was thrilling to hear the reports of miracles and to watch the crowd grow until a stadium was required to hold everyone. When I visited a service on April 15, I was blessed by Heather Clark’s music and the audience’s exuberant worship. And I laughed with everyone else as I watched Bentley shout his trademarked “Bam! Bam! Bam!” as he prayed for the sick and flailed his tattooed arms over the crowd. Hey, Jesus didn’t pray for people according tothe Pharisees’ rulebook, so I’m open to unconventional methods. But I would be dishonest if I told you that I wholeheartedly embraced what I saw in Lakeland. Something disturbed me, but I kept my mouth shut for three weeks while I prayed, got counsel from respected ministry leaders and searched my heart to make sure I was not harboring a religious spirit. The last thing we need today is more mean-spirited heresy hunters blasting other Christians. I am not a heresy hunter, and I support what is happening in Lakeland because I know God uses imperfect people (like me and you) to reach others for Jesus. At the same time, I believe my questions are honest and my concerns are real. My motive is not to criticize Bentley or the pastor who is sponsoring these meetings, Stephen Strader. In September 2002 Charisma featured a seven-page article about Bentley’s amazing conversion from drug addiction. I believe Bentley is a sincere brother who wants people to encounter God’s presence and power. No doubt this 32-year-old evangelist needs our prayers now more than ever, especially since he has become the focus of international media attention. 1. Beware of strange fire. The name of Jesus is being lifted up in the Lakeland revival, and three people came to the altar for salvation the night I attended. Larger numbers have come to the front of the auditorium to find Christ every night since then. Yet I fear another message is also being preached subtly in Lakeland—a message that cult-watchers would describe as a spiritual counterfeit. Bentley is one of several charismatic ministers who have emphasized angels in the last several years. He has taught about angels who bring financial breakthroughs or revelations, and he sometimes refers to an angel named Emma who supposedly played a role in initiating a prophetic movement in Kansas City in the 1980s. Bentley describes Emma as a woman in a flowing white dress who floats a few feet off the floor. All of us who believe the Bible know that angels are real, and that they work on our behalf to protect us and minister to us. But the apostle Paul, who had encounters with angels himself, issued stern warnings to the Corinthians, the Galatians and the Colossians about angels who preach another gospel or that demand attention. In Colossae, believers were so enamored with angels they had seen in visions that they became “inflated without cause” by spiritual pride (Col. 2:18, NASB). Paul was adamant that preoccupation with angels can lead to serious deception. We need to tread carefully here! We have no business teaching God’s people to commune with angels or to seek revelations from them. And if any revival movement—no matter how exciting or passionate—mixes the gospel of Jesus with this strange fire, the results could be devastating. We need to remember that Mormonism was born out of one man’s encounter with a dark angel who claimed to speak for God. 2. Beware of bizarre manifestations. When the Holy Spirit’s power comes on people they may feel weak or even fall. The Spirit’s power can also cause people to tremble, shake, laugh or cry. Such manifestations are biblical and we should leave room for them. But where do we draw the line between legitimate experience and fanatical excess? The apostle Paul had to deal with outrageous charismatic manifestations in the Corinthian church. People were acting like raving lunatics—and turning the church in to a free-for-all of unbridled ecstatic behavior. Paul called for discipline and order, and he reminded early Christians that “the spirits of prophets are subject to prophets” (1 Cor. 14:32). In other words, Paul was saying that no one under the influence of the Holy Spirit should act out of control. In many recent charismatic revivals, ministers have allowed people to behave like epileptics on stage—and they have attributed their attention-getting antics to the Holy Spirit. We may think it’s all in fun (you know, we’re just “acting crazy” for God) but we should be more concerned that such behavior feeds carnality and grieves the Spirit. When exotic manifestations are encouraged, people can actually get a religious high from jerking, vibrating, screaming or acting intoxicated. (I have even been around people who writhed as if in pain, or made sexual noises—thinking this was a legitimate spiritual experience.) But emotional euphoria doesn’t guarantee a heart change. The person who is bucking like an untamed bronco in a church service would benefit more from sitting still and reading the Bible for an hour. When we put bizarre behavior on the platform we imply that it is normative. Thus more strange fire is allowed to spread. 3. Beware of hype and exaggeration. Our hearts are crying out today for a genuine move of God. We want the real deal. We’ve read about the Great Awakenings of the past and we long to see our nation overcome by a wave of repentance. The church is in a backslidden state, and our nation has rebelled against God. We are desperate! In our longing for a holy visitation, however, we must be careful not to call the first faint breeze of the Spirit a full-fledged revival. If we do that, we are setting people up for disappointment when they realize it may not be what we blew it up to be. Some of the language used during the Lakeland Revival has created an almost sideshow atmosphere. People are invited to “Come and get some.” Miracles are supposedly “popping like popcorn.” Organizers tout it as the greatest revival in history. Such brash statements cheapen what the Holy Spirit is doing—and they do a disservice to our brothers and sisters who are experiencing New Testament-style revival in countries such as Iran, China and India. We have a long way to go before we experience their level of revival. Let’s stay humble and broken before the Lord. I am rejoicing over all the reported healings at the Lakeland meetings. Miracles are awesome. Crowds are great. But miracles and crowds alone don’t guarantee a revival. Multitudes followed Jesus during His ministry on earth, but many of the people who saw the dead raised or ate food that was supernaturally multiplied later crucified the Son of God. It was the few disciples who followed Jesus after Calvary who ushered in a true revival—one that was bathed in the fear of God, confirmed by signs and wonders, tempered by persecution and evidenced by thousands of conversions, new churches and the transformation of society. We should expect nothing less. J. Lee Grady is editor of Charisma. Please continue to keep Myanmar in your prayers. There are over 34,000 confirmed dead and relief has only reached only a small portion of those needing assistance. According to BBC News, the spokeswoman of the UN Office for the Coordination of Humanitarian Affairs (OCHA) in Geneva, Elizabeth Byrs, warned that its teams had only been able to reach 270,000 people - less than a fifth of the estimated total of survivors. "We are only seeing the peak of the iceberg, and the situation risks becoming a lot more dramatic if there isn't an acceleration of humanitarian aid," she said. So far, she said, the World Food Programme had been able to send only 361 tonnes of food aid - and distribute just 175 tonnes. A further 55,000 tonnes of rice would be needed to feed those most in need for the next three months, Ms Byrs said. Half of the rice would need to beimported. "The scope of the disaster is huge," she warned. "That's why we need to act quickly in order to avoid a second disaster or maybe a third disaster." Please pray for a quick acceleration of the relief effort and that the government of Myanmar will allow professional relief workers from other nations to organize and distribute the supplies so many are still waiting to receive. for the massive numbers of people-men, women and children- who have lost their loved ones and had their lives so terribly disrupted. Thanks for remembering these situations. "God is most glorified when we are most satisfied in Him"
I've been thinking a lot about this quote recently. God didn't create us to serve Him, He created us to know Him. Many people think that in order to love God, we must serve God. We think, in order to receive God's blessing, we must do something to achieve it. Many Christians I know only relate to God for what He can do for them, or what He can give them. Not many seek God for God. I think God must get really frustrated when most people just treat Him like Santa Clause. God is not our employer and we are not just His employees. God created us for friendship. We were created for worship. God is love. What He wants more than anything else is that we would seek Him for Him, and get to know Him because we want to, not because we have to. I don't serve God for what He can do for me, or for what plans He has for me. To think that would be selfish and self serving. I serve God because I love Him. I love to love Him because He is the most amazing Person I have ever known. His love is incomparable. His presence is all I need. The Devil can take away everything in my life, my health, my wealth, my relationships, my career, my money, my life, but He can't take away my Jesus. That is one thing the enemy can never destroy. He can't destroy my love for God and God's love for me. That my friend is the one thing that will last throughout eternity when this life is over...that is, our love relationship with God. (John 17:3) That we may know Christ and Christ alone, may this be my aim. Study the book of Job. He loved God not for what God could do for him. But Job loved God for God. Because He is worthy to be worshiped. God, I love You! The Bella DVD comes out May 6th. I ask each of you to not only buy a copy of the DVD after reading this, but to encourage everyone you know in your sphere of influence and networks to do the same. I signed on to help this small company "Metanoia Films" to help them promote this film to as many people as possible, because this movie has not only changed my life, but has been impacting thousands with a beautiful message of life. 15 women decided not to have an abortion after watching this film. Bella is one of those stories that can change the heart of a generation. Imagine how one movie could impact millions around the world with God's message, Bella is that movie. Please send the below link to as many people as possible asking them to join the Bella 10 Campaign (www.bella10campaign.com) so we can see millions touched with God's heart. Buy the DVD on amazon.com now, it will help boosts the ratings so that the film will have a big DVD opening release. Let's support the cause of LIFE! Please pray that God uses this movie to change the minds and hearts of this generation for the good.